J B WARD (1902) The 28 ton 48 foot wood schooner J B Ward parted both anchor chains and stranded in Inunudah Bay on Umnak Island at 6 p.m. Saturday September 6, 1902. The vessel departed Unalaska August 29, 1902 bound for Umnak with two passengers and three crewmen. She was carrying 15 tons or $1,500 worth of general cargo. Conditions at the time were reported as a gale, rough seas, cloudy and evening. Three anchors and two chains had been put out to avoid the casualty. The J B Ward, worth $2,000, became a total wreck. Half of her cargo was salvaged. There was no insurance on the vessel or her cargo. The passengers and crew were rescued by the U S Revenue Cutter Manning who brought them to Unalaska, arriving September 29, 1902. The James Allen, worth $10,000 and her cargo were listed as total losses. The vessel had $15,000 worth of insurance. At least 25 passengers and crew were lost. All of the casualties occurred subsequent to the James Allen stranding. 5th Mate Andrew Robinson stayed with the ship and was lost. The rest of the crew escaped to four boats and soon became separated in the darkness and foul weather. Boat #1 found their way to a settlement on Atka Island and the crewmembers were rescued by the steamer Dora after a week. Survivors from Boat #1 included Third Mate Joseph Duarte (Dewatt), Forth Mate Charles C. McIntyre, Steerer John Roach, Steerer Joseph Gonzales, Seaman Peter T. Peterson, Seaman Max Gohne, Cook Thomas Gordge (Goody) and Landsman Frederick Hill (seaman Fred Hub). Boat #2 with 1st Mate Thomas Yellot, 2nd Mate William F Allen and 13 others disappeared and was never seen again. Boat #3 capsized and William Fitzgerald of San Francisco, Engineer John (James) White, Blacksmith G. E. Loy(Lay)(E. Eloy) and Frank Murphy drowned. Captain Huntley’s boat capsized and Patrick Connoly, Sam Masterson (Masterman), William Dory (Dorey), Harry Taylor, Boat steerer Joseph Pena (Portuguese) and Austin Gideon all died of exposure. Survivors from Boat #3 and the Captains boat eventually made it to the beach at Umnak Island a week after the wreck of the James Allen. There they survived for two weeks, six of the men dying of exposure. Those lost to the cold weather included William Dory, Joseph Pena, Sam Masterson, Austin Gideon, Harry Taylor and Pat Connelly. Captain Huntley and five men left the remaining nine men on Umnak Island and took a boat and provisions and headed for Unalaska for help. It took a week to get to Unalaska and another two days to return to Umnak to rescue the remainder of the crew of the James Allen. Unfortunately the nine sailors left behind had given up all hope and in a depraved mental condition took to consuming their lost shipmates whose bodies had been preserved by the cold climate. When Captain Huntley returned from Unalaska with the U S Revenue cutter Bear the men he had left behind were all huddled in a small smoke filled dugout, barely alive and unable to walk or even speak. JAMIE LYNN (1987) The 93 foot crab fishing vessel Jamie Lynn sank April 21, 1987 approximately 90 miles north of Dutch Harbor. The vessel was being towed by the processor Long Harbor. The Jamie Lynn had been damaged earlier in Saint Paul Harbor. Three crewmembers aboard the Jamie Lynn were lost including skipper Chris Clark of Cordova, Isaac Zacharof (23) of Saint Paul and Anton Kochegin (18) of Saint Paul. JEFFRON (1982) The fish processor Jeffron caught fire and was lost August 30, 1982 in Captains Bay, Unalaska Island. JESSICA B (1990) The 77 foot fishing vessel Jessica B was forced ashore and lost December 28, 1990 at Kashega Bay on Unalaska Island. All hands were rescued. Attempts to salvage the vessel were futile. All pollutants were removed from the Jessica B and she was left on the rocks where she went aground. 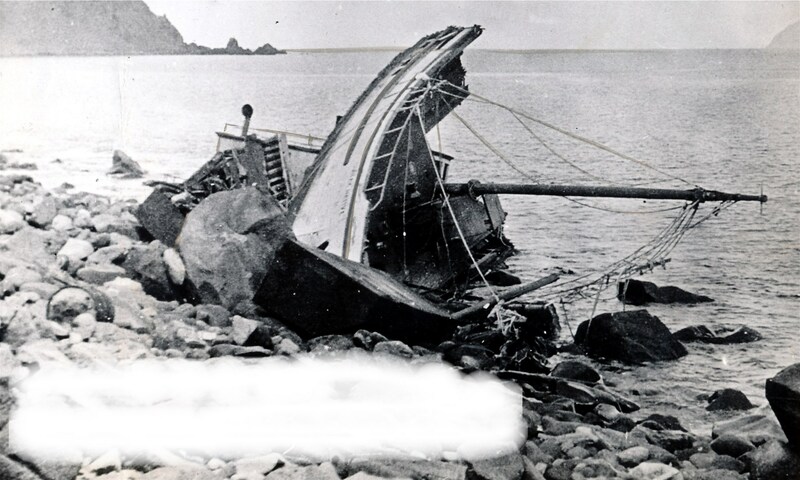 JINKO MARU (1871) The Japanese junk Jinko Maru washed ashore at Adak May 15, 1871 with three surviving crew aboard. The vessel was travelling from Ise to Kamano, Japan with a cargo of rice in November of 1870 when she lost her rudder and masts in a storm and went adrift. The survivors were eventually taken to San Francisco aboard the H M Hutchinson. JINNY C (1963) The 72 ton 68 foot wooden oil screw fishing vessel Jinny C stranded and was lost October 13, 1963 at Crescent Bay. Wreckage from a vessel, a skeleton and a bowl were found by ADF&G personnel in August of 1982 at Bechevin Bay. JODY ANN (1994) The 82 foot crab fishing vessel Jody Ann flooded from the stern and sank February 25, 1994 in the Bering Sea northwest of Saint Paul Island. Winds were at 40 knots, seas 20 feet and temperature 19 degrees Fahrenheit. The vessel was loaded with crab pots and engaged in the Opilio Crab fishery when she began taking on water in her aft spaces and lazarette area. Crab gear on deck prevented access to the aft deck. Attempts made to locate the problem and dewater the vessel were not successful. She sank minutes after the crew abandoned ship to a life raft. They were picked up by the fishing vessel Scandies Rose. All five crewmembers were rescued by the U S Coast Guard. JUNYO MARU NO 3 (1956) The 84 ton Japanese salmon fishing vessel Junyo Maru No 3 disappeared with all hands May 18, 1956 near the Aleutian Islands. The vessel had a crew of 22. Pieces of debris from the Junyo Maru No 3 were found by her mother ship. Comment: This vessel was also reported fishing off of Kamchatka.